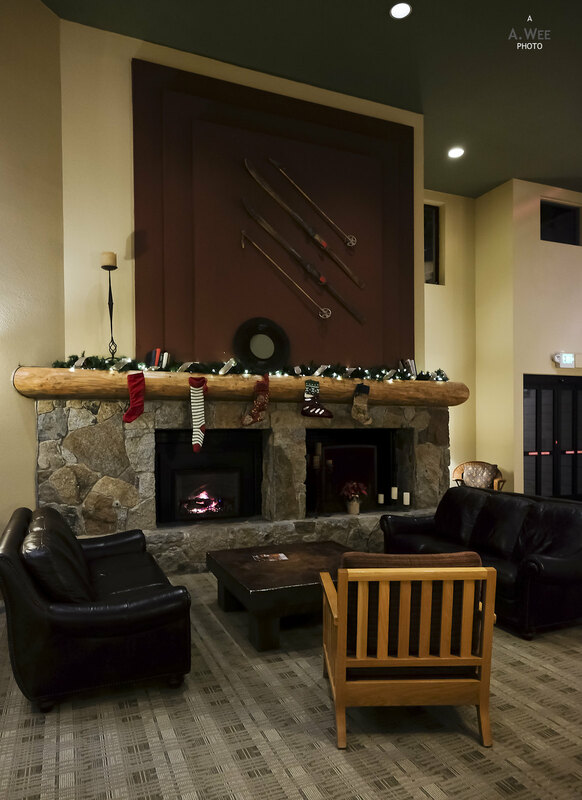 With Squaw Valley Lodge being one of the available ski-in/ski-out accommodations, it was the one I picked over staying in Tahoe City. After all if I am going to ski, might as well stay in the hotel closest to the ski lifts. Getting to the hotel was not too difficult since I went early in the winter season when the heavy snowfall has yet to arrive. This meant the roads were clear of snow and the drive from Sacramento was easy without any heavy traffic. The hotel provides covered parking as well with the garage connected to the main lodge (building no 2), while the rooms and suites are spread over a total of 7 buildings, as shown in the resort layout below. With a driveway, I parked my rental car there before checking in at the reception desk. As expected the suite was not ready yet when I arrived before noon. Check-in formalities was still a bit backward here with guests required to fill up their particulars on a paper while I was provided with a map of the area along with a parking permit that I was supposed to place on the car’s dashboard. 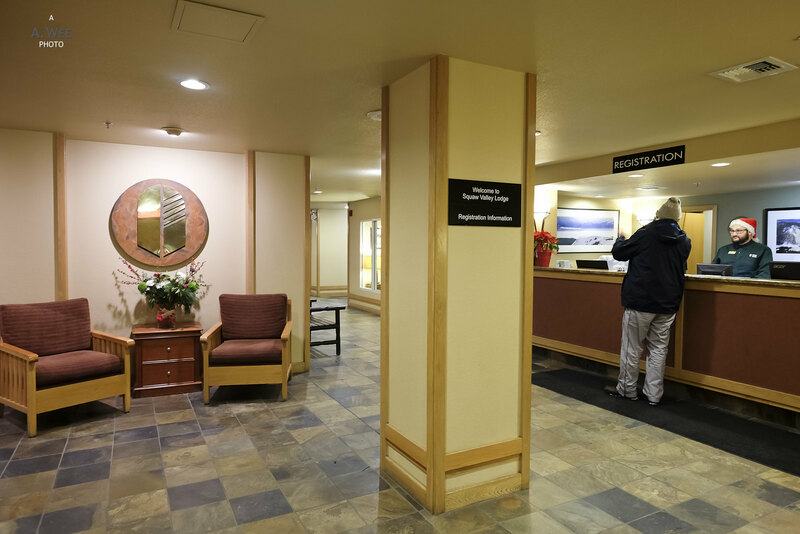 The hotel’s receptionist was friendly but not the most thorough in explaining all the amenities of the hotel and the feeling was that of someone checking into a suburban bed and breakfast. Not a complaint though since it emits a charm that would resonate with families visiting for the holidays. 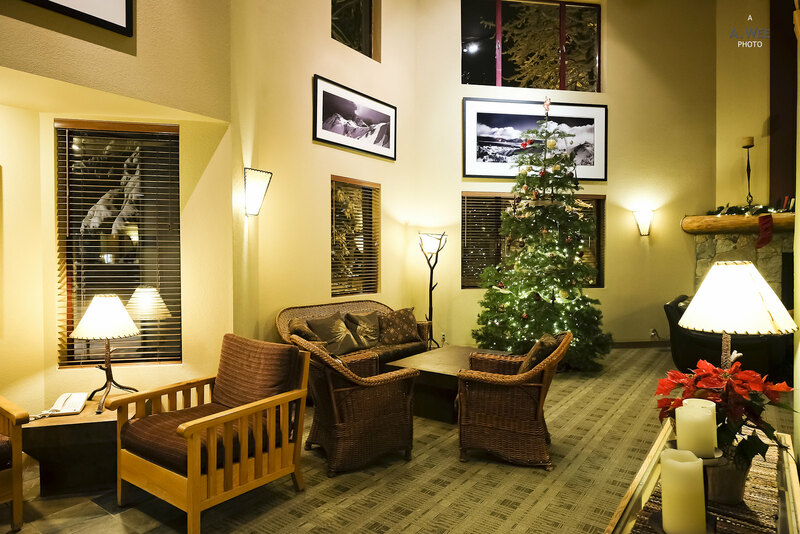 The lobby located in the main lodge has plenty of seating and was decked out in festive decorations as I stayed over Christmas. This meant there was plenty of families visiting as well. 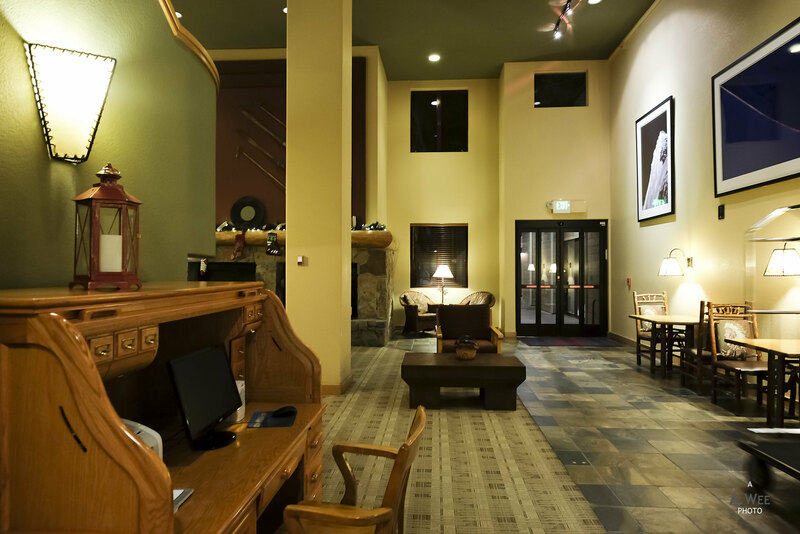 However the lobby was pretty quiet most nights and does not see much crowds even though it was a comfortable place to hang out in with the fireplace and vintage ski decors, complete with a tall ceiling. Since my room was not ready, I left my mobile number with the reception as I head up the mountains for my first ski day. With that I was provided with a key card to access the changing rooms and facilities of the hotel. It was not until around 3pm that the receptionist called me while I was still on the mountains to inform me the room was ready. 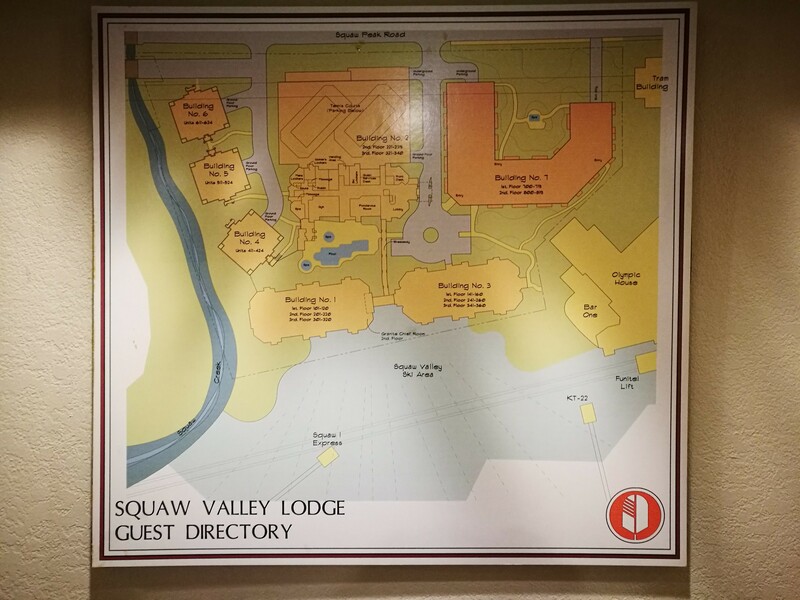 At this time I would also like to explain that this hotel functions like a condominium hotel with the units being owned and rented out by their owners, while Squaw Valley Lodge acts as their manager. Both building 1 and 3 is connected by a walkway to the main lobby and they are probably the closest to the ski area. Do note that the walkway is not heated though it was enclosed so it can get a bit chilly if you use it to get back to the rooms from the swimming pool. 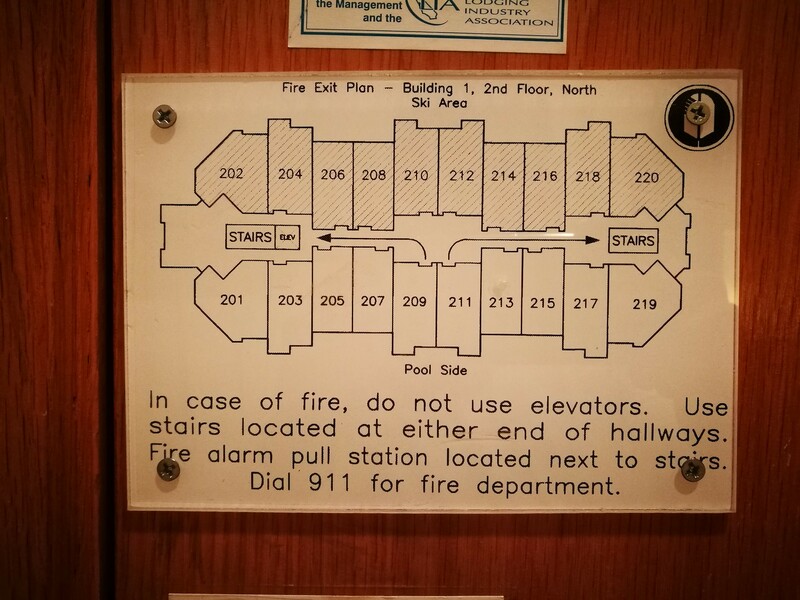 I would have preferred a room in building 3 if I ever visit again but I was fortunate enough to get one in building 1 that faces the swimming pool and hot tub. 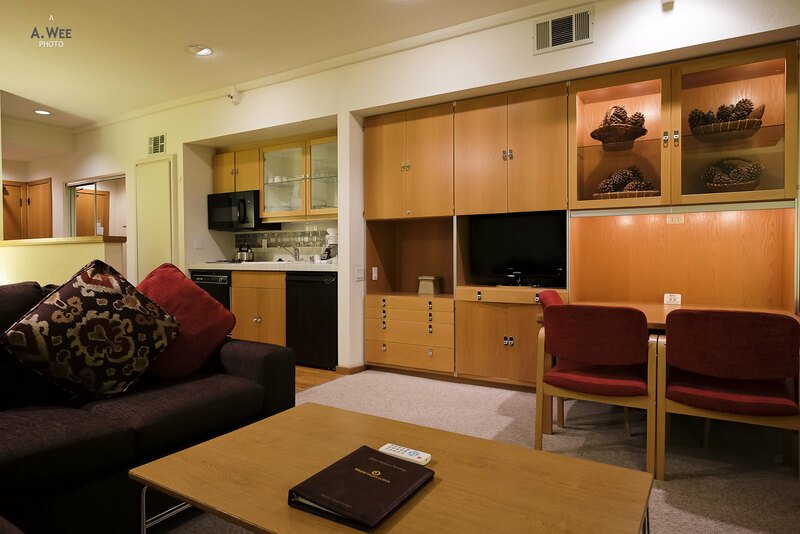 The room I had reserved through a third party website shows a queen size bed with a sofa bed, and I was assigned what looks like a Deluxe Studio Suite which is their base category of rooms. 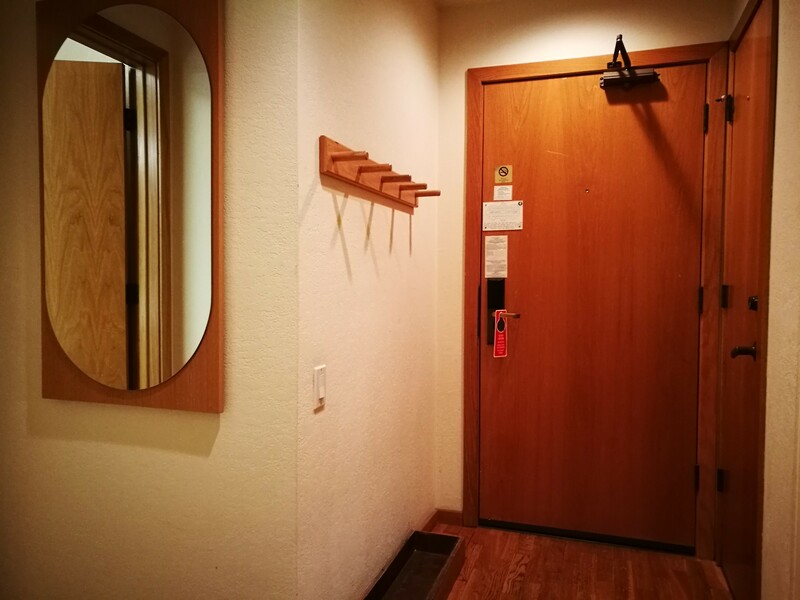 This category is a suite in its own right though as it was spacious and featured a foyer on entry with a hanger and a wooden tray underneath to hold your skis and boots that might have some snow and ice. On the right of the room, there is a door that leads to the bathroom and the entrance is set a bit back to create more privacy and space for a wall mirror. Inside, the bathroom design was a bit outdated and feels like it was never renovated since the 1980s. The bathroom vanity counter has plenty of space though and stretches the whole length of the wall. 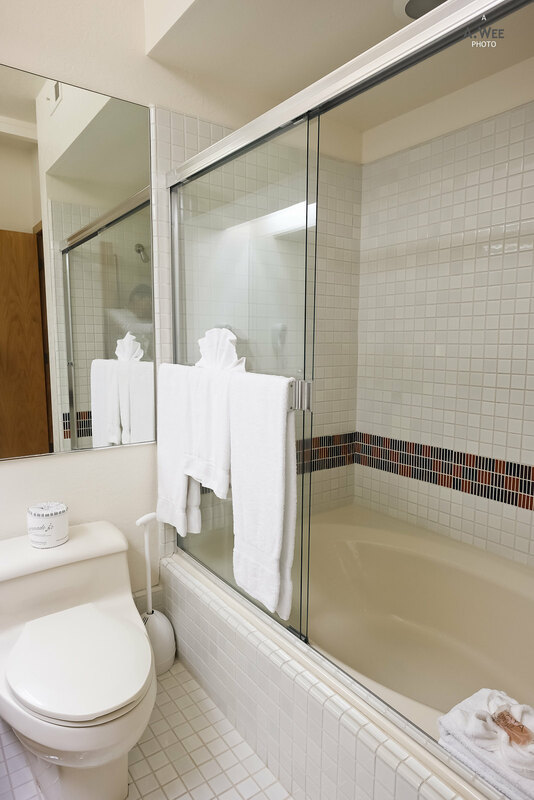 Across from the vanity there is a bathtub and shower combination with a sliding glass door. The glass door works well in the smaller space and feels cleaner than the usual shower curtains. 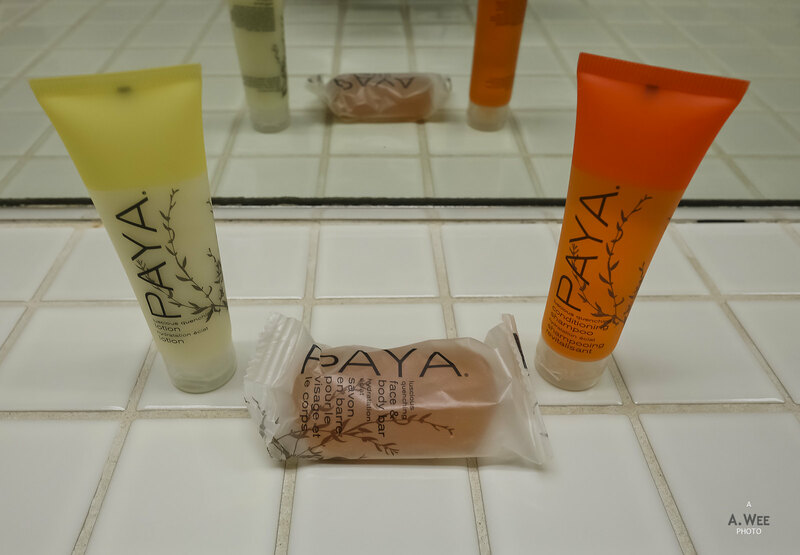 There was towels provided inside the bathroom along with toiletries by Paya, a brand I encountered previously in Crystal Lodge and Suites in Whistler. 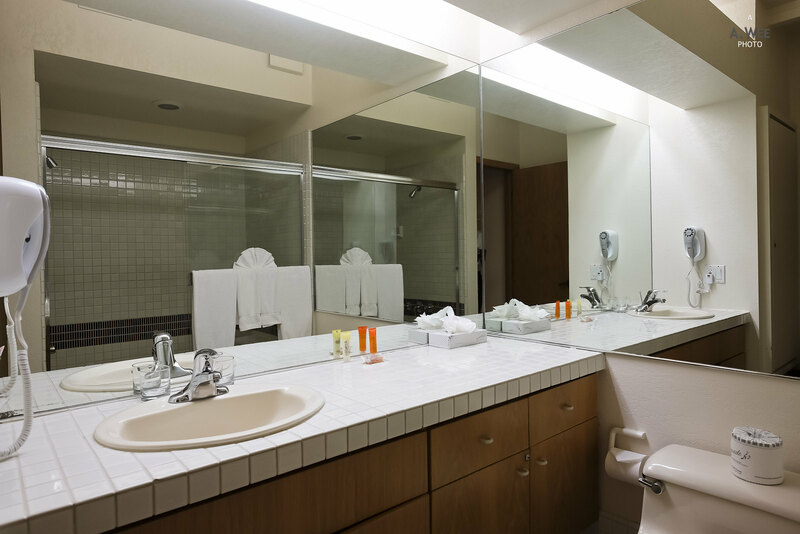 Could it be that ski resorts source their toiletries from the same company? Since I am not too fond of the scent and the colour of the amenities, I did not use them. Instead I had brought my own toiletries which I used. These amenities were not replenished either during my stay. Considering the bathroom was quite small for a suite, I was delighted that the room itself was large. First in the room is a closet with sliding mirror doors. Past the closet was a kitchenette, and there was a wall partition the height of my chest between the kitchenette and the double bed. This wall partition has a swivelling table that functions as extra countertop for preparing of breakfast or dinner. I thought it was a great feature since it can be stowed away when not needed. 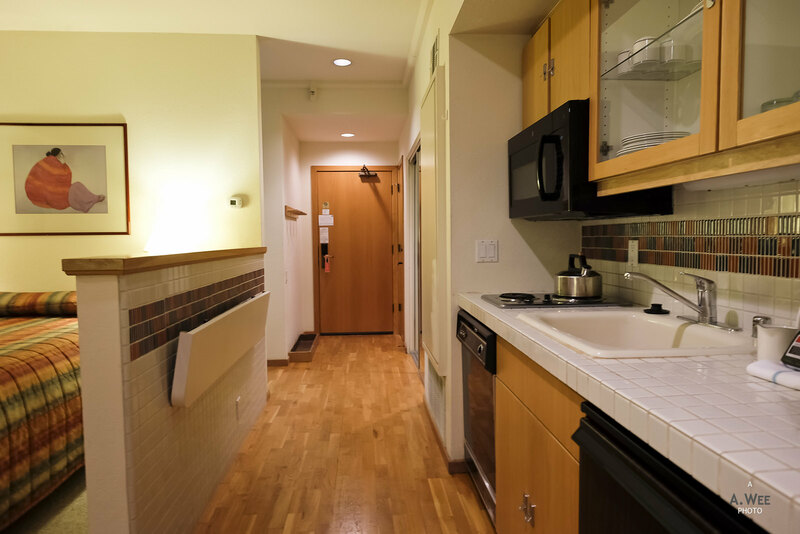 The kitchenette felt a bit like a full kitchen with a cooking surface for 2 pots, a dishwasher machine below it, a mini bar fridge, an over-the-counter microwave oven and a kitchen sink. While utensils were provided along with knives, cutleries and plates, the conditions of some of the items were questionable and frankly I was not too keen to be cooking inside with the old utensils that has some spots. 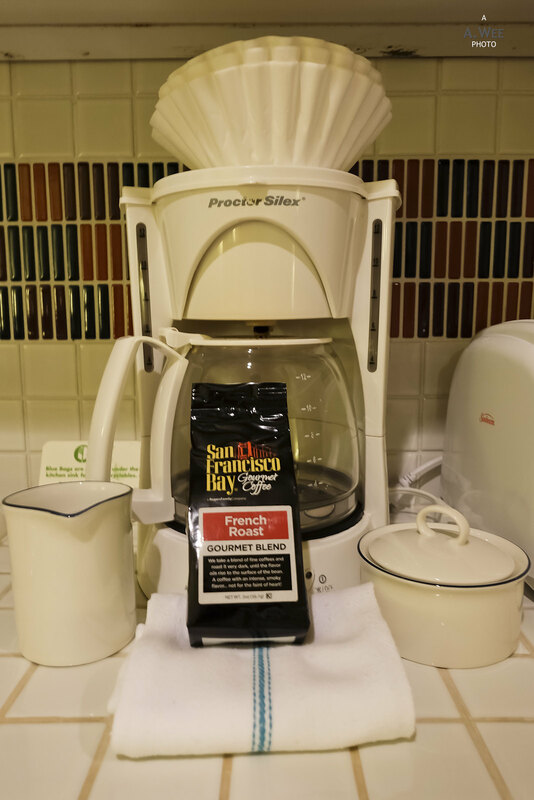 Included on the kitchen countertop was another old coffee brewing machine with a single pack of ground coffee. This pack of coffee was never replenished either by the housekeeping that was done every day, even though they knew I consumed the coffee in the morning. Perhaps it has something to do with the pack of coffee being able to last for 2-3 days when making 2 cups of coffee each day? Enclosed in between chest height wall partitions is the double bed which seems a bit small. Given this was a studio, the bed was visible from both the kitchenette and the living room. There was plenty of cabinet across from the bed and on the night stands beside the bed. More storage space is found in the living room itself with a large TV cabinet that houses some of the utensils. I did notice some cabinets were locked which could be to store stuff owned by the unit owners. There was a comfortable L-shaped sofa that could be pulled out to form a larger bed. Though I noted the sofa was comfortable enough to sleep for one person given how large it was. What was terrible about the living room was the small puny TV set that is more suitable for a study table. Definitely shows the budget pricing for this unit. I know people do not come to ski resorts to watch TV but when you’re resting in the room after a full day on the slopes, it is nice to be able to have some entertainment. The living room cabinet is attached to a large square table with four chairs that could function as both a dining room and a table for gaming or to do some work. 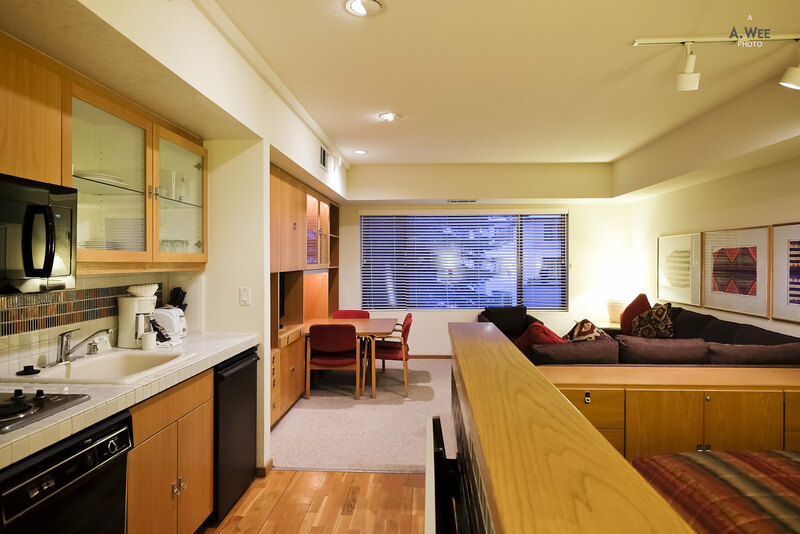 This space does work quite well for both groups of ski buddies or a small family. The assigned suite has a view of the hot tub and the pool which can get a bit noisy in the late afternoon when most skiers get back from the slopes to use the facilities. The alternative is getting one with a view of the trees between the lodge building and the ski lifts which can get noisy in the day when the ski lifts starts to run. As I mentioned earlier, there is a fairly large outdoor pool and hot tub located in the courtyard area between building 1 and the main building 2. The hot tub was one of the largest I saw and up to 10 or more people could comfortable be seated around the perimeter with more standing in the middle. There is also a sheltered area housing a grill beside the hot tub for guests to do their own barbeque. This might be kind of awkward when there are plenty of people using the hot tub and pool. 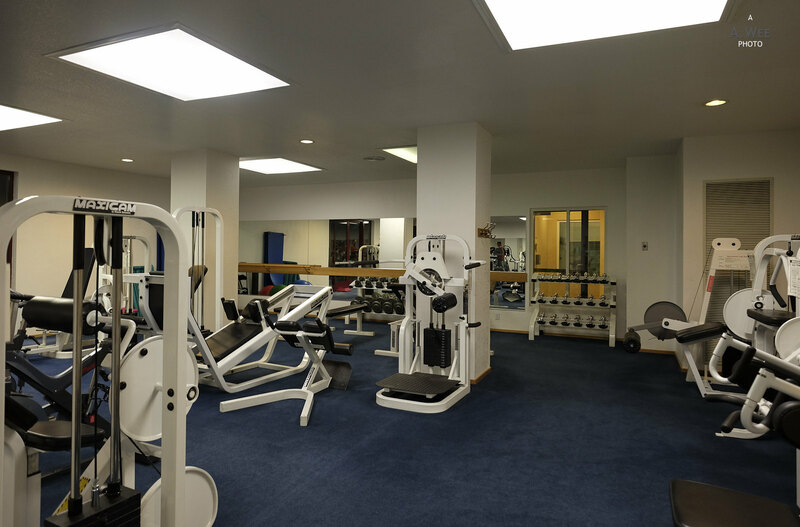 Nearly all the facilities can be found in the main lodge which is building 2. 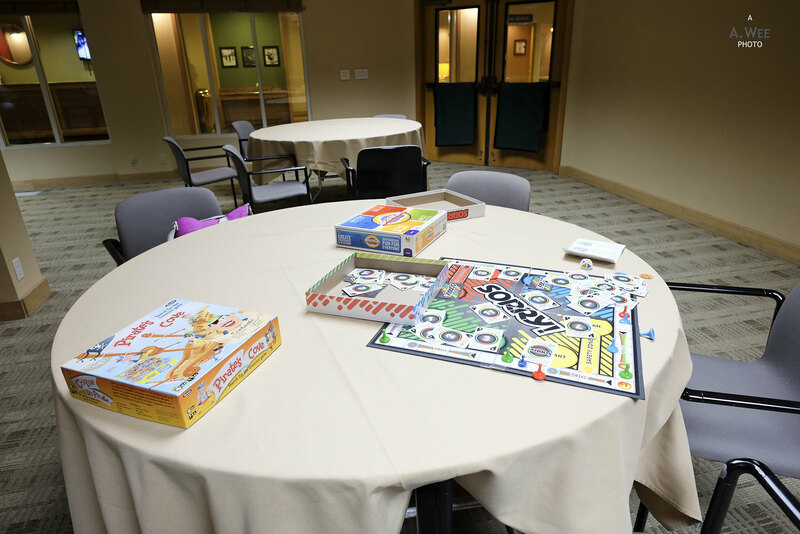 There is an enclosed multi-function room that has board games and plenty of tables and chairs. A lone desktop computer sits beside the stairs in the lobby lounge for guests to access the internet. 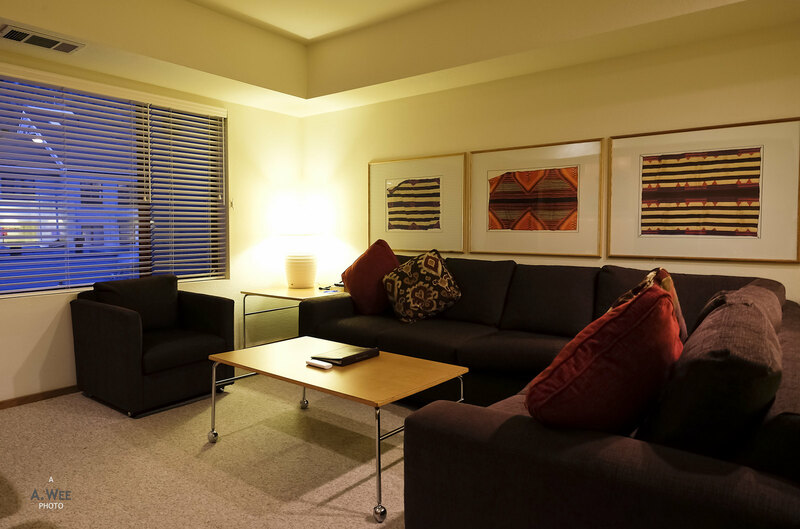 Beside the multi-function room, there is a TV lounge and some more sofas along with a fairly well equipped fitness centre. 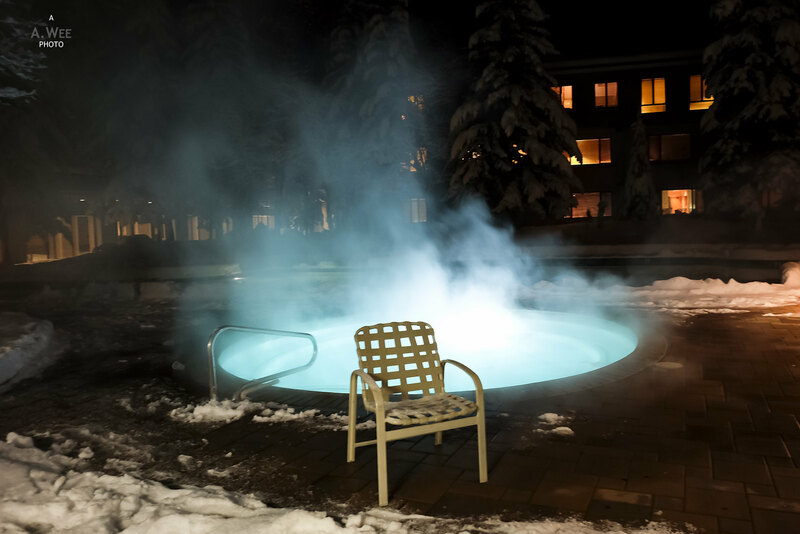 There are also some indoor hot tubs beside the fitness centre, where the main access towards the hot tub and outdoor pool is located from. 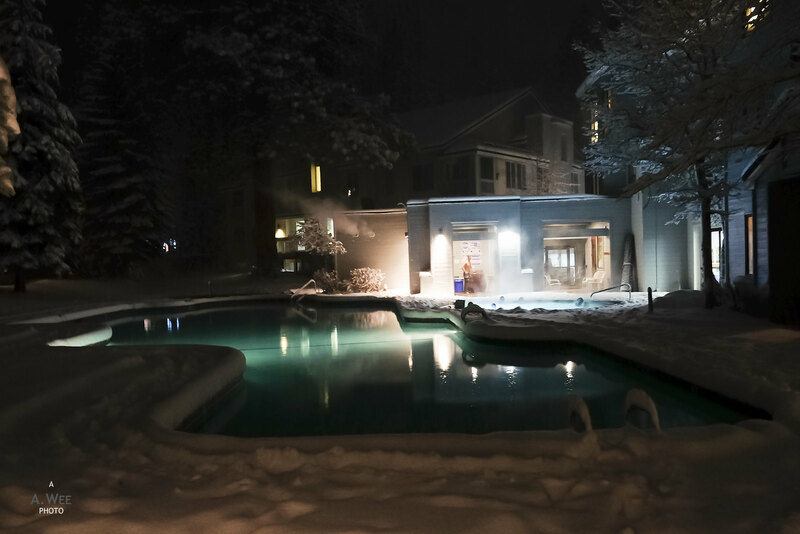 A separate sauna area for men and women can be found outside the changing and shower rooms so the lodge does have the usual facilities for a spa in a ski resort. There is even an outdoor tennis court on top of the parking garage building that can be accessed by the stairs in building 2. Though this last facility is not opened since the space was covered with snow. 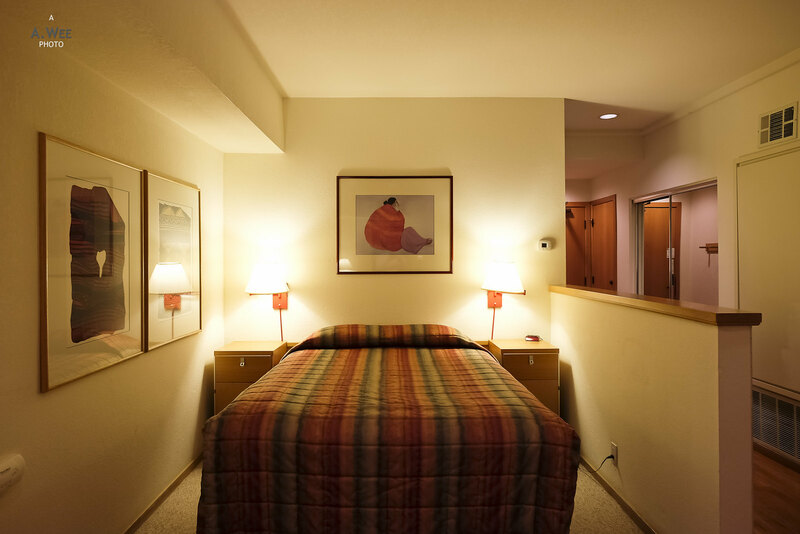 One night at the lodge costs around $220++ (~C$298), and that was not too expensive. Considering I stayed in the hotel over Christmas Eve and Christmas, it was a good value for a festive ski trip. 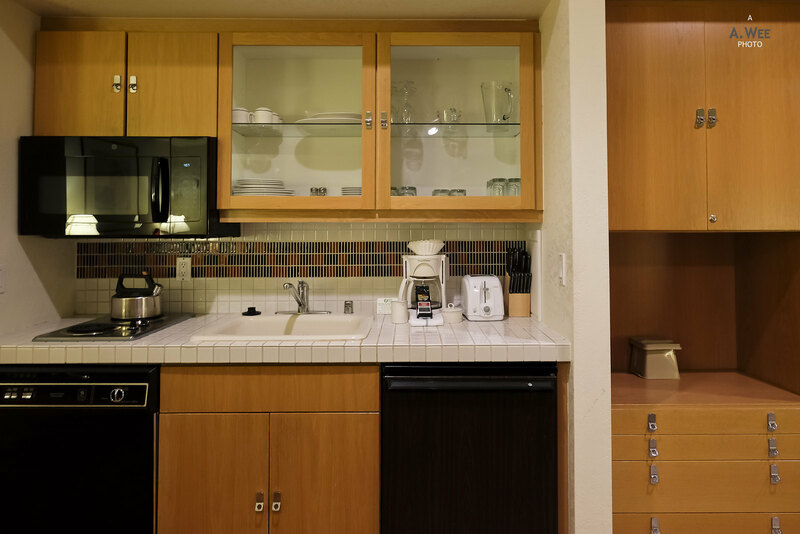 Large suites with kitchenettes and utensils makes it easy to cook some simple meals or order takeaways from the numerous dining outlets in the village and makes sense for a longer term stay for up to a week. However the quality of the amenities and furnishings does make it seem old and undesirable. Were it not for the convenient access to the slopes and my need for more space for this trip as I was travelling with friends, I would probably look to stay elsewhere. 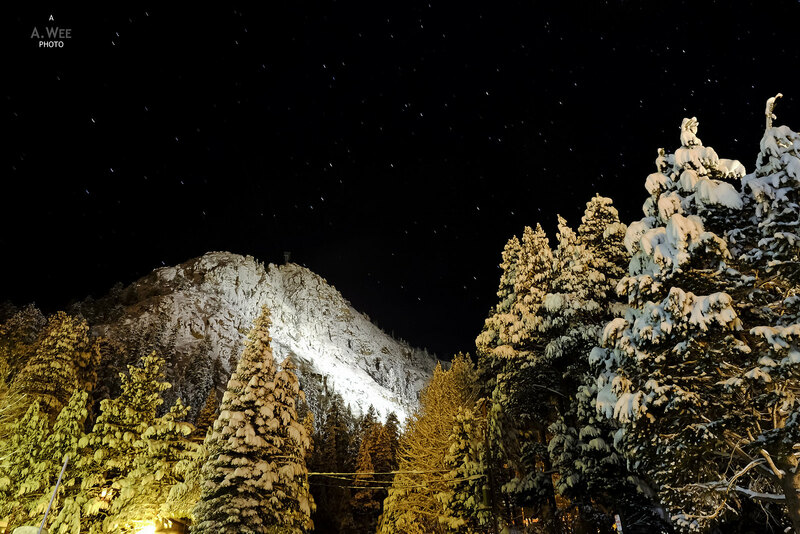 I sure hope that more ski resorts could have better accommodation options and Squaw Valley is one of those that requires more variety of ski lodges. Great review, makes me want to go skiing!